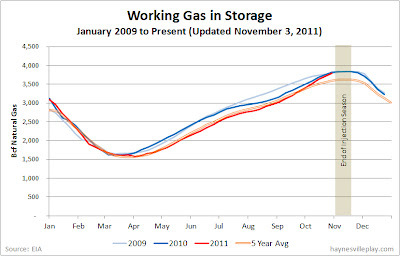 The weekly EIA working gas in storage report showed a 78 Bcf net injection, bringing the total amount of gas in storage to 3.794 Tcf. The weekly injections continue to surpass the previous year (+67 Bcf) and the five year average (+35 Bcf). 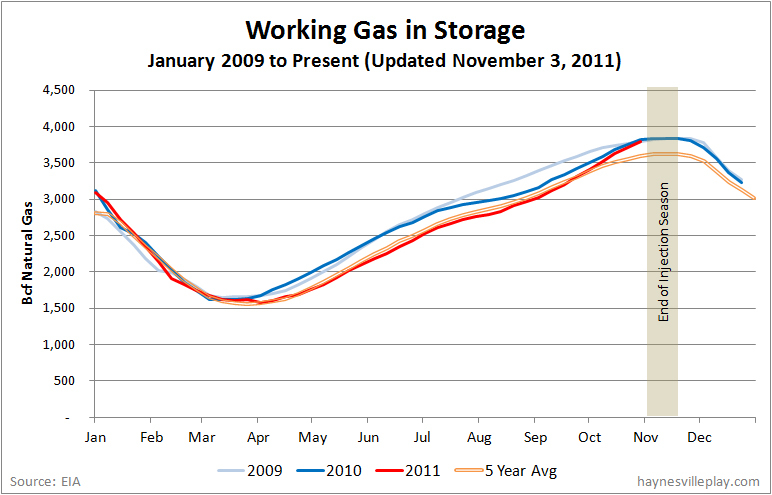 The current storage level is only 17 Bcf lower than last year, while being 201 Bcf higher than the five year average. Normally, this time of year the injection season is winding down, but current activity seems to indicate otherwise. Temperatures last week averaged 1.1 degrees warmer than normal, but 3.7 degrees cooler than last year. With a strong burst of cold weather this week, the momentum might shift, but at this point the current storage level is only 46 Bcf lower than the record high storage level of 3.84 Tcf achieved in 2010. While this is lower than the demonstrated peak capacity of 4.103 Tcf (reported by the EIA as of April 2011), it is nevertheless a concerning level.